In my last post I explained that these Customer Experience Reviews link back to this Harvard Business Review piece (https://hbr.org/2015/06/the-internet-of-things-is-changing-how-we-manage-customer-relationships) where I talk about the potential to know which of six things is a customer’s #1 objective in entering an experience. In the last post I looked at McDonald’s, and highlighted the fact that, for now, they are really missing out on the opportunity to get to know their customers better. One thing I didn’t mention, that came back to me in a comment, is how people expect to feel when they leave McDonald’s and how that might be different from one of the six objectives going in – and this is an important part of tracking customer experience journeys. In my case, when I eat at McDonald’s, which isn’t very often, it’s for the speed of service for sure, but I also do enjoy their Filet-o-Fish and I expect to feel the way I felt as a little kid eating that sandwich. That’s part of the magic that McDonald’s still has for people. Which brings us to Nike. Nike is a very different kind of brand and experience, because buying their products is usually just the very beginning of the experience journey – and how we feel when we have that swoosh logo on our shoes our our clothes, is often at the core of why we buy their products. So the first two items, price and speed of service are literally zero on the scale of the opportunity/brand promise. The current state juts out from the other two, to a “3” because nowadays we can to the Nordstrom Rack or a discount seller and get Nike products for a bargain. Then we get into the meat if the issue with #3, Unique Product / Service. Back in the days of Michael Jordan playing basketball, Nike became a super brand, people wearing Air Jordans had status and they were envied, and sometimes robbed (or worse) for those shoes. Since then, Nike has gotten into shirts and shorts and socks and hats and the brand isn’t as magical as it once was, but the Swoosh still stands for high quality athletic performance to a lot of people. The brand promise is that there is nothing like Nike, their opportunity isn’t quite at that level these days (LuluLemon Athletica is arguably the only brand that can make that claim today). And the current state has fallen back quite a ways. 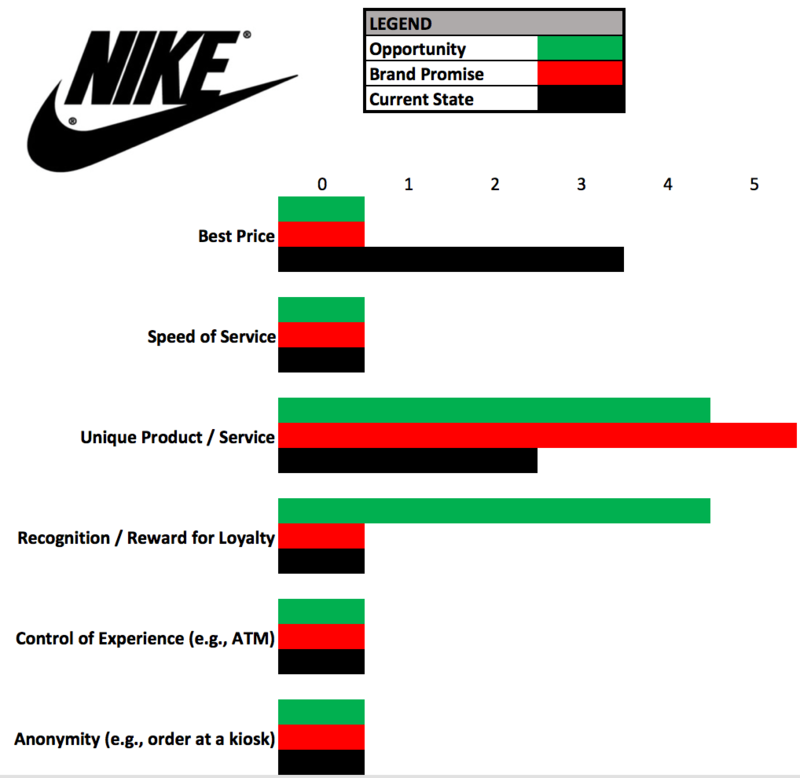 #4, Recognition / Reward for Loyalty is something that no one would have thought twice about ten years ago, but as soon as Nike put that little pod in the bottom of the shoe so you could track your progress, and from there experimented into the wearables space with the pioneering FuelBand – Nike became the first brand in its class to try to establish a relationship with its customers (pay attention McDonald’s). While the FuelBand has been sunsetted, Nike seems to appreciate that this is a huge opportunity, and while the brand promise isn’t there yet, and the current state still lags, it seems likely that Nike will emerge, again, as a leader in this space by establishing a relationship with their customers, so they can recognize and reward their loyal customers. Even if someone only buys a pair of shoes once every five years, Nike can connect with that person every time they log a run, or a walk and that people can feel part of the Nike community. It looks like Nike is paying attention and I expect they will be in great shape again very soon. Numbers 5 and 6, control of the experience and anonymity also don’t really apply to these experiences so I am not going to spend a great deal of time on them. Customer experience journeys were mentioned earlier – there will be more on those in future posts. The key aspects of those usually fall into simple high level categories such as Discover, Enroll, Plan, Arrive, Experience, Remember/Reflect. While those are durable, for something more momentary like a meal at McDonald’s, the experience journey is very different from a pair of Nike running shoes which might last years. Stay tuned for more on those.